Well it looks like Little Red Riding Hoods house actually! Yesterday I improv pieced this domicile! Look the wee bird is nestling up to the warm chimney! Little Red lives in a straw house in the wood. There is a small flower garden in front of the window where her Matroyshka mum waits and watches to see she comes safely back from Garndma's! 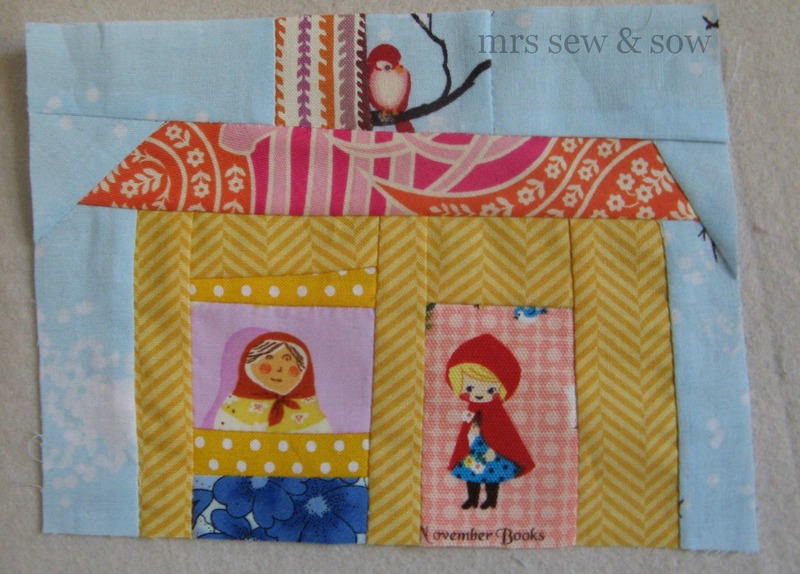 This little house will be my wonky house addition to the quilt from yesterday - and will fit snuggly in the border! I have words to paper piece and some other blocks, including all the siggy blocks to piece into the border - this could take some time! Oh it's lovely! You're on a roll! I love it! The little bird is so cute! It's going to be a wonderful quilt!! You are nuts. Very talented, but nuts. I love it! Oh very, very cute! And what Sarah said. Such a cute little house! 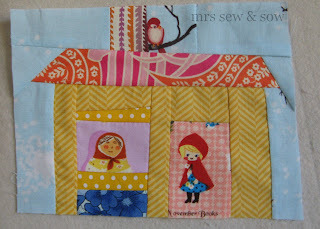 I love the yellow and red fabrics- everything goes together so well! When was the last time you left your sewing room!? Hmm, mum looks a tad grumpy, was LRRH late home?! This is the house of cuteness. All things cute must live in homes like this.